Not to be confused with Impressionistic Music, which has different characteristics from this type of music. 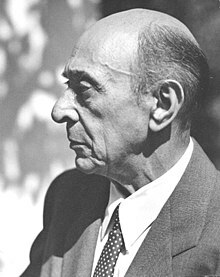 Arnold Schoenberg, the key figure in the Expressionist movement. The term expressionism "was probably first applied to music in 1918, especially to Schoenberg", because like the painter Wassily Kandinsky (1866–1944) he avoided "traditional forms of beauty" to convey powerful feelings in his music (Sadie 1991, 244). Theodor Adorno sees the expressionist movement in music, as seeking to "eliminate all of traditional music's conventional elements, everything formulaically rigid". This he sees as analogous "to the literary ideal of the 'scream' ". As well Adorno sees expressionist music, as seeking "the truthfulness of subjective feeling without illusions, disguises or euphemisms". Adorno also describes it as concerned with the unconscious, and states that "the depiction of fear lies at the centre" of expressionist music, with dissonance predominating, so that the "harmonious, affirmative element of art is banished" (Adorno 2009, 275–76). Expressionist music often features a high level of dissonance, extreme contrasts of dynamics, constant changing of textures, "distorted" melodies and harmonies, and angular melodies with wide leaps (Anon. 2014). The three central figures of musical expressionism are Arnold Schoenberg (1874–1951) and his pupils, Anton Webern (1883–1945) and Alban Berg (1885–1935), the so-called Second Viennese School. Other composers that have been associated with expressionism are Ernst Krenek (1900–1991) (the Second Symphony, 1922), Paul Hindemith (1895–1963) (Die junge Magd, Op. 23b, 1922, setting six poems of Georg Trakl), Igor Stravinsky (1882–1971) (Three Japanese Lyrics, 1913), Alexander Scriabin (1872–1915) (late piano sonatas) (Adorno 2009, 275). Another significant expressionist was Béla Bartók (1881–1945) in early works, written in the second decade of the 20th century, such as Bluebeard's Castle (1911) (Gagné 2011, 92), The Wooden Prince (1917) (Clements 2007), and The Miraculous Mandarin (1919) (Bayley 2001, 152). American composers with a sympathetic "urge for such intensification of expression" who were active in the same period as Schoenberg's expressionist free atonal compositions (between 1908 and 1921) include Carl Ruggles, Dane Rudhyar, and, "to a certain extent", Charles Ives, whose song "Walt Whitman" is a particularly clear example (Carter 1965, 9). Important precursors of expressionism are Richard Wagner (1813–1883), Gustav Mahler (1860–1911), and Richard Strauss (1864–1949) (Anon. 2000; Mitchell 2005, 334). Later composers, such as Peter Maxwell Davies (1934–2016), "have sometimes been seen as perpetuating the Expressionism of Schoenberg, Berg, and Webern" (Griffiths 2002), and Heinz Holliger's (b. 1939) most distinctive trait "is an intensely engaged evocation of … the essentially lyric expressionism found in Schoenberg, Berg and, especially, Webern" (Whittall 1999, 38). Musical expressionism is closely associated with the music Arnold Schoenberg composed between 1908 and 1921, which is his period of "free atonal" composition, before he devised twelve-tone technique (Schoenberg 1975, 207–208). Compositions from the same period with similar traits, particularly works by his pupils Alban Berg and Anton Webern, are often also included under this rubric, and the term has also been used pejoratively by musical journalists to describe any music in which the composer's attempts at personal expression overcome coherence or are merely used in opposition to traditional forms and practices (Fanning 2001). It can therefore be said to begin with Schoenberg's Second String Quartet (written 1907–08) in which each of the four movements gets progressively less tonal (Fanning 2001). The third movement is arguably atonal and the introduction to the final movement is very chromatic, arguably has no tonal centre, and features a soprano singing "Ich fühle Luft von anderem Planeten" ("I feel the air of another planet"), taken from a poem by Stefan George. This may be representative of Schoenberg entering the "new world" of atonality (Fanning 2001). In 1909, Schoenberg composed the one-act 'monodrama' Erwartung (Expectation). This is a thirty-minute, highly expressionist work in which atonal music accompanies a musical drama centered around a nameless woman. Having stumbled through a disturbing forest, trying to find her lover, she reaches open countryside. She stumbles across the corpse of her lover near the house of another woman, and from that point on the drama is purely psychological: the woman denies what she sees and then worries that it was she who killed him. The plot is entirely played out from the subjective point of view of the woman, and her emotional distress is reflected in the music. The author of the libretto, Marie Pappenheim, was a recently graduated medical student familiar with Freud's newly developed theories of psychoanalysis, as was Schoenberg himself (Carpenter 2010, 144–46). In 1909, Schoenberg completed the Five Pieces for Orchestra. These were constructed freely, based upon the subconscious will, unmediated by the conscious, anticipating the main shared ideal of the composer's relationship with the painter Wassily Kandinsky. As such, the works attempt to avoid a recognisable form, although the extent to which they achieve this is debatable. This plot is highly symbolic, written as it was by Schoenberg himself, at around the time when his wife had left him for a short while for the painter Richard Gerstl. Although she had returned by the time Schoenberg began the work, their relationship was far from easy (Biersdorfer 2009). The central forging scene is seen as representative of Schoenberg's disappointment at the negative popular reaction to his works. His desire was to create a masterpiece, as the protagonist does. Once again, Schoenberg is expressing his real life difficulties. In around 1911, the painter Wassily Kandinsky wrote a letter to Schoenberg, which initiated a long lasting friendship and working relationship. The two artists shared a similar viewpoint, that art should express the subconscious (the "inner necessity") unfettered by the conscious. Kandinsky's Concerning The Spiritual In Art (1914) expounds this view. The two exchanged their own paintings with each other, and Schoenberg contributed articles to Kandinsky's publication Der Blaue Reiter. This inter-disciplinary relationship is perhaps the most important relationship in musical expressionism, other than that between the members of the Second Viennese School. The inter-disciplinary nature of expressionism found an outlet in Schoenberg's paintings, encouraged by Kandinsky. An example is the self-portrait Red Gaze (see Archived link), in which the red eyes are the window to Schoenberg's subconscious. Anton Webern's music was close in style to Schoenberg's expressionism, c. 1909–13, and subsequently his music "became increasingly constructivist on the surface and increasingly concealed its passionate expressive core" (Fanning 2001). His Five Pieces for Orchestra, Op. 10 (1911–13) are from this period. Alban Berg's contribution includes his Op. 1 Piano Sonata, and the Four Songs of Op. 2. His major contribution to musical expressionism, however, were very late examples, the operas Wozzeck, composed between 1914 and 1925, and unfinished Lulu (Reich 2013). Wozzeck is highly expressionist in subject material in that it expresses mental anguish and suffering and is not objective, presented, as it is, largely from Wozzeck's point of view, but it presents this expressionism within a cleverly constructed form. The opera is divided into three acts, the first of which serves as an exposition of characters. The second develops the plot, while the third is a series of musical variations (upon a rhythm, or a key for example). Berg unashamedly uses sonata form in one scene in the second act, describing himself how the first subject represents Marie (Wozzeck's mistress), while the second subject coincides with the entry of Wozzeck himself. This heightens the immediacy and intelligibility of the plot, but is somewhat contradictory with the ideals of Schoenberg's expressionism, which seeks to express musically the subconscious unmediated by the conscious. Berg worked on his opera Lulu, from 1928 to 1935, but failed to complete the third act. According to one view, "Musically complex and highly expressionistic in idiom, Lulu was composed entirely in the 12-tone system" (Reich 2013), but this is by no means a universally accepted interpretation. The literary basis of the opera is a pair of related plays by Frank Wedekind, whose writing is virtually a "reversal of the expressionist aesthetic", because of its complete indifference to the characters' psychological states of mind, and portrayal of characters whose "personalities have little or no basis in reality and whose distortions are not the product of psychological tension" (Gittleman 1968, 134). The plainly evident emotion of Berg's music is dislocated from its cause and "deflected onto something else impossible to define", thereby contradicting its own intensity and undermining the listener's "instinctive obedience to emotive instructions", contrary to expressionism, which "tells its listeners pretty unambiguously how to react" (Holloway 1979, 37). In contrast to the plainly expressionist manner of Wozzeck, therefore, Lulu is closer to the Neue Sachlichkeit (New Objectivity) of the 1920s, and to Bertolt Brecht's epic theatre (Jarman 1991, 19–20, 94–96). Indeed, by the time Wozzeck was performed in 1925, Schoenberg had introduced his twelve-tone technique to his pupils, representing the end of his expressionist period (in 1923) and roughly the beginning of his twelve-tone period. As can be seen, Arnold Schoenberg was a central figure in musical expressionism, although Berg, Webern, and Bartók did also contribute significantly, along with various other composers. Adorno, Theodore. 2009. Night Music: Essays on Music 1928–1962, edited by Rolf Tiedemann, translated by Wieland Hoban. London, New York, and Calcutta: Seagull Books. ISBN 9781906497217. Anon. 2000. "Expressionism". Microsoft® Encarta® Online Encyclopedia. Anon. 2014. "Music: Expressionism". BBC GCSE Bitesize website. Bayley, Amanda (ed.). 2001. The Cambridge Companion to Bartók. Cambridge: Cambridge University Press. Biersdorfer, J. D. 2009. "Setting the Stage with Shadows". The New York Times (22 May). Carpenter, Alexander. 2010. "Schoenberg's Vienna, Freud's Vienna: Re-Examining the Connections between the Monodrama Erwartung and the Early History of Psychoanalysis". Musical Quarterly 93, no. 1:144-181. Carter, Elliott. 1965. "Expressionism and American Music". Perspectives of New Music 4, no. 1 (Fall–Winter1965): 1–13. Clements, Andrew. 2007. "Classical Preview: The Wooden Prince". The Guardian (5 May). Fanning, David. 2001. "Expressionism". The New Grove Dictionary of Music and Musicians, second edition, edited by Stanley Sadie and John Tyrrell. London: Macmillan Publishers. Gagné, Nicole V. 2011. Historical Dictionary of Modern and Contemporary Classical Music. Plymouth, England: Scarecrow Press. Gittleman, Sol. 1968. Frank Wedekind. Twayne's World Authors Series TWAS 55. New York: Twayne. ISBN 9780804422338. Griffiths, Paul. 2002. "Expressionism." The Oxford Companion to Music, edited by Alison Latham. Oxford Music Online. Oxford University Press (accessed 22 Oct. 2013). Holloway, Robin. 1979. "The Complete Lulu". Tempo, no. 129 (June 1979), 36–39. Jarman, Douglas. 1991. Alban Berg: Lulu. Cambridge and New York: Cambridge University Press. Mitchell, Donald. 2005. Gustav Mahler: The Wunderhorn Years: Chronicles and Commentaries. Rochester, NY: Boydell Press. Reich, Willi. 2013. "Alban Berg." Encyclopædia Britannica, online academic edition. Encyclopædia Britannica Inc. (Accessed 22 October 2013). Sadie, Stanley (ed.). 1991. The Norton Grove Concise Encyclopedia of Music. New York: W. W. Norton. Schoenberg, Arnold. 1975. Style and Idea: Selected Writings of Arnold Schoenberg, edited by Leonard Stein, translated by Leo Black. London: Faber and Faber. Whittall, Arnold. 1999. "Holliger at 60: Keeping the Faith". The Musical Times 140, no. 1867 (Summer): 38–48. Behr, Shulamith, David Fanning, and Douglas Jarman. 1993. Expressionism Reassessed. Manchester [UK] and New York: Manchester University Press ISBN 0-7190-3843-X (cloth); 0719038448 (pbk). Celestini, Federico. 2009. "Der Schrei und die Musik: Mahlers Klänge in Weberns Orchesterstück op. 6/2". In Webern21, edited by Dominik Schweiger and Nikolaus Urbanek, 55–71. Wiener Veröffentlichungen zur Musikgeschichte 8. Vienna: Böhlau. ISBN 978-3-205-77165-4. Crawford, John C., and Dorothy L Crawford. 1993. Expressionism in Twentieth-Century Music. Bloomington: Indiana University Press. ISBN 0-253-31473-9. Fanning, David. 'Expressionism', Grove Music Online ed. L. Macy (Accessed [12-06-2005]). Franklin, Peter. 1993. "'Wilde Musik': Composers, Critics and Expressionism". In Expressionism Reassessed, edited by Shulamith Behr, David Fanning, and Douglas Jarman, 112–20. Manchester: Manchester University Press. ISBN 9780719038440. Hailey, Christopher. 1993. "Musical Expressionism: The Search for Autonomy". In Expressionism Reassessed, edited by Shulamith Behr, David Fanning, and Douglas Jarman, 103–11. Manchester: Manchester University Press. ISBN 9780719038440. Harrison, Daniel. 2004. "Max Reger Introduces Atonal Expressionism". The Musical Quarterly 87, no. 4 (Winter: Special Issue: Max Reger): 660–80. Hinton, Stephen. 1993. "Defining Musical Expressionism: Schoenberg and Others". In Expressionism Reassessed, edited by Shulamith Behr, David Fanning, and Douglas Jarman, 121–29. Manchester: Manchester University Press. ISBN 9780719038440. Lessem, Alan. 1974. "Schönberg and the Crisis of Expressionism". Music and Letters 55, no. 4 (October): 429–36. Neighbour, Oliver W., 'Glückliche Hand, die', Grove Music Online ed. L. Macy (Accessed [12-06-2005]). Neighbour, Oliver W., 'Erwartung', Grove Music Online ed. L. Macy (Accessed [12-06-2005]). Kandinsky, Wassily. 1914. The Art of Spiritual Harmony, translated by M. T. H. Sadler. London: Constable and Company Limited. Unaltered reprint, as Concerning the Spiritual in Art. New York: Dover Publications Inc. ISBN 0-486-23411-8. Revised edition, as Concerning the Spiritual in Art, translated by Michael Sadleir, with considerable te-translation by Francis Golffing, Michael Harrison, and Ferdinand Ostertag. The Documents of Modern Art 5. New York: George Wittenborn, Inc., 1947. New translation, as On the Spiritual in Art: First Complete English Translation with Four Full Colour Page Reproductions, Woodcuts and Half Tones, translated by Hilla Rebay. New York: Solomon R. Guggenheim Foundation, 1946. Poirier, Alain. 1995. L'Expressionnisme et la musique. Paris: Fayard. ISBN 2-213-59243-8. Samson, Jim. 1977. Music In Transition. London: J. M. Dent & Sons Ltd.